February 1, 2012. Cases filed before February 1 are not subject to the new process. You can read more about the changes on the Professional Liability Fund Web site. Select News, then Multnomah County – New Civil Case Management Process. In December, I wrote about the new filing fee requirements under HB 2287. Since that time Tanya Hanson and I have had the opportunity to work with staff at the Multnomah County Civil Department to hone the document that was first posted on our Web site. If you are confused or frustrated you are not alone. If your case qualifies for the reduced filing fee provided by ORS 21.110 (2) – which applies to some specific types of claims for relief that involve recovery amounts of $10,000 or less – you are exempt from the additional party fee, and you do not need to use the fee calculator. The filing fee for civil actions which qualify under ORS 21.110 (2) is $137. There is no ORS 21.110 (1) (b) “additional party” fee; this exception to the additional party fee is provided by Chief Justice Order 09-052. Another difference under HB 2287 for these “under $10,000” cases concerns multiple defendants. If there are multiple defendants, the defendants appearing jointly in an action filed under ORS 21.110 (2) may pay only a single appearance fee. For every other type of civil action, whether seeking recovery of a monetary amount or nonmonetary relief, the claim has a base fee of $197 for monetary claims up to $49,999, and, for monetary claims of $50,000 or more, there is a graduated fee scale depending on the total amount of the monetary claims in the case. There is also an “additional party” fee under ORS 21.110 (1) (b) for these cases; the additional party fee applies to every additional party beyond one plaintiff and one defendant and parties appearing jointly must each pay a filing or appearance fee. For all of these cases parties should use the Oregon Judicial Department’s Fee Calculator when filing or appearing in the action. ORS 21.110(7) now requires that civil pleading captions include a statement of the amount claimed. This is a new requirement for cases with a claim of $50,000 or more. If your complaint does not include this information in the caption, it can be rejected and you may miss a filing deadline. Section 1 of the fee calculator is for the exclusive use of plaintiffs and petitioners. Use Section 2 if you are a defendant or respondent. 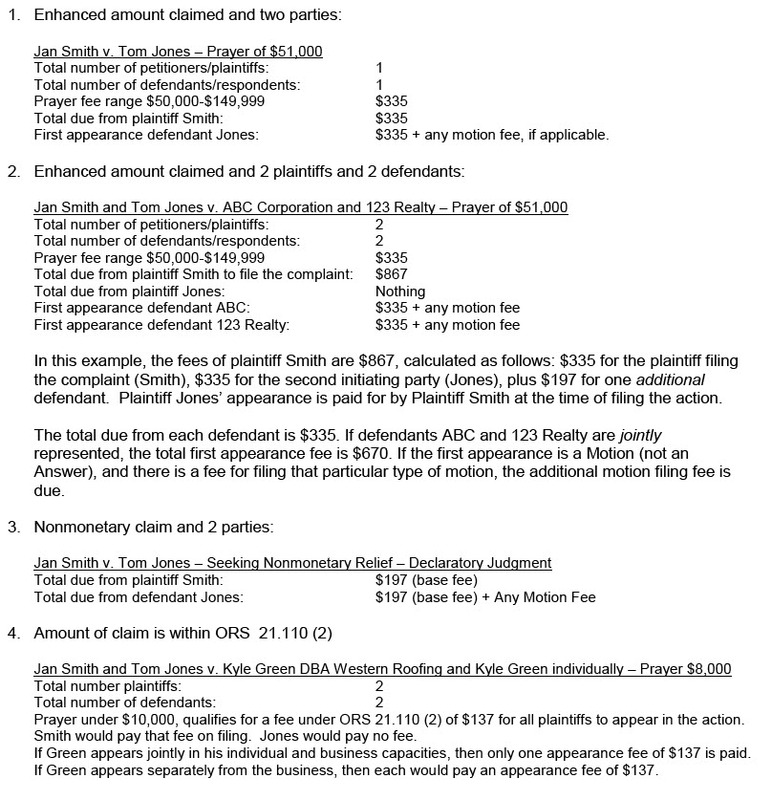 If plaintiff Jones is represented separately, plaintiff Jones also owes $867. 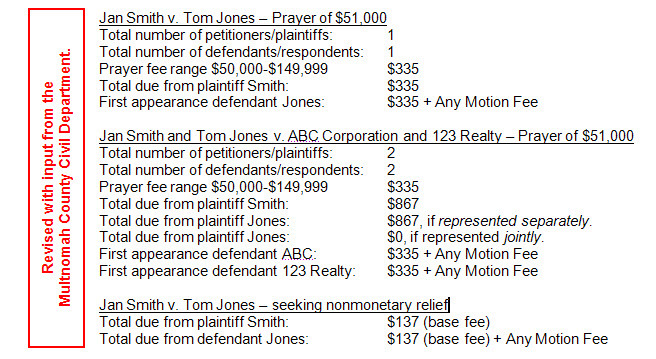 If plaintiffs Smith and Jones are jointly represented, Smith pays $867 as the first initiating party; Jones owes nothing. The total due from each defendant is $335. If defendants ABC and 123 Realty are jointly represented, the total first appearance fee is $670. If the first appearance is a Motion (not an Answer), an additional fee is due. Note: Parties filing a third-party complaint will pay a separate fee from their original appearance as a plaintiff or defendant. The Oregon Judicial Department (OJD) fee calculator does not recognize decimal places. When calculating your fee, enter your prayer amount in round numbers. Chief Justice Order 09-052 establishes exemptions from certain statutory fees. For example, a party may request a hardship exemption from the additional party fee when more than five parties are named in the pleading. Exemptions are granted on an individual basis. (Parties must apply separately for relief.) When requesting an exemption, come to ex parte prepared: bring your initiating document or first appearance document and ex parte Order. Pay the ex parte fee. Appear at ex parte. If relief is granted, take the signed ex parte Order to the cashier, file your initiating document or appearance, and pay the reduced fee. If you are paying multiple fees on the same case or separate fees for multiple parties, consider issuing separate checks. This will make it easier for the court clerk to properly apply your payments. Appellate court fees are available here. Circuit court fees vary by county. Use the “Select a Court” option on the OJD Web site to find the fee schedule for your specific jurisdiction. Civil actions, suits, and proceedings filed on or after October 1, 2009, and before July 1, 2011. Hearing and trial requests filed on or after October 1, 2009. First and annual accountings filed in probate on or after October 1, 2009. If a plaintiff filed an action before October 1, 2009, then the pre-October 1 fees apply if and when the defendant files an appearance. However, third-party complaint fees apply to third-party complaints and appearances filed on or after October 1, 2009. Check the language of HB 2287 if in doubt. Parties who did not pay a first appearance fee and are now appearing in court for the time on a post-judgment matter or at ex parte will be required to pay the applicable post-judgment or ex parte fees in addition to the applicable first appearance fee. All documents requiring a fee must be accompanied by the correct payment. If you mail a complaint or first appearance to the court and underpay the fee, your document may be shredded without notice and you may miss a filing deadline. If a party pays a fee for which it is not responsible, it may not be refunded. If a fee is overpaid, it may not be refunded. If no fee is paid, your document may be shredded without notice. Do not rely on the court to give you a courtesy call or return rejected documents by mail. Courts are understaffed and underbudgeted, even with the new fee structure. Instead, take initiative. Check the fee schedule on the court’s Web site. 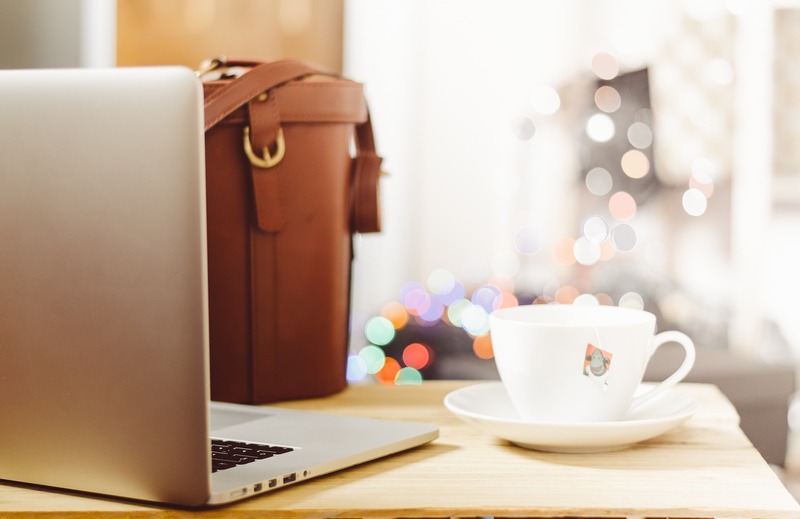 When filing remotely, always allow extra time to recover from possible errors – like submitting an incorrect fee – and enter a followup date on your calendar to verify that the filing was received and processed before the ultimate deadline. Remember to be patient and courteous toward court staff. The new filing fee requirements are a challenge for everyone. Presently, courts cannot accept fees in advance or issue tickets, credits, or other proof of payment to be applied toward future filing fees. All fees must be paid when they are incurred. Multnomah County is considering the possibility of a speed-pass or other system that would allow advance payment. The form of payment varies from court to court. Some take credit cards; some do not. For others, accepting credit cards is a work in progress. If you are unsure what form of payment is acceptable in your jurisdiction, call the clerk’s office or check the court’s Web site. If you are appearing at ex parte in person, allow ample time to pay fees in advance. Note: ex parte times in Clackamas County have recently changed. In Clackamas County, clerks are available in the courtroom to process ex parte payments. In Multnomah County, all fees must be paid in advance at the cashier’s window. Each court is different. Check the court’s Web site or call beforehand if you are unsure of the payment procedure. If you are submitting an ex parte Motion and Order by mail, your check must accompany the ex parte Order. If no payment is received, your Order is subject to shredding without notice. Although some courts have generously returned documents in the past, most can no longer afford to do so. Come to ex parte with all copies you wish to be conformed. If you want the judge to have the court file available to him or her at the time of ex parte, make appropriate arrangements in advance. Ex parte fees must be paid even if the court does not sign your Order. Ex parte fees must be paid even if the motion is stipulated. Some matters are exempt from ex parte fees. Fees for Motions on civil proceedings are always due at the time of filing. If the Motion is contested and results in an Order, there is no additional fee due at the time of signing. If the Motion is contested and results in a Judgment, an additional fee will be due at the time of signing. Trial fees are paid by the petitioner or plaintiff. Settlement fees must be paid by in advance by each party attending a settlement conference. “Party” includes the original plaintiff or petitioner, original defendant or respondent, third-party plaintiffs, third-party defendants, and trustees. Guardians ad litem are not a “party” for settlement fee purposes. It is unlikely that fees for ex parte Orders, Judgments, and similar documents are recoverable by the prevailing party. Pro Tem judges cannot sign the prevailing party’s Judgment on a Motion for Summary Judgment until the fee is paid. In Multnomah County, attorneys are advised to take the Pro Tem Judge’s Letter Opinion to the cashier, pay the appropriate fee, then submit the Judgment for signature along with proof of payment. For those who missed it, “Fees – Clackamas, Multnomah & Washington County: What, When, and How?” should be available shortly as a digital download on the MBA’s CLE Web site. My sincere thanks to PLF Loss Prevention Attorney Tanya Hanson for her editing skills and contributions to this post.